The Federal Republic of Germany is situated in the heart of Europe with nine neighbor countries. Germany is a link between East and West and between Scandinavia and the Mediterranean. It covers an area of about 357,000 km2, 876 km from north to south and 640 km from west to east. The total length of the countries borders is 3,758 km. The terrain consists of a variety of landscapes, from coastal lowlands in the north, the central upland range to the Alpine foothills in the south and the Bavarian Alps with the highest point, Zugspitze (2,962 m). The Federal Republic of Germany is a densely populated country. Some 83 million inhabitants live here, which corresponds to a population density of 231 persons per square kilometre. Areas of high population density have formed over the last decades along both sides of the Rhine valley (Rhine axis) and in the periphery of the Rhenish-Westphalian industrial area. Population density has also increased in the Ems region and around the cities of Bremen, Hanover, Braunschweig, Hamburg, Munich, Nuremberg and Augsburg. In 2017, the gross domestic product at current prices amounted to 3.26 trillion USD. Upon price adjustment, the increase from 2016 was 3.8 %. German economy is based on industry. 12 million people are working in this sector whilst only 1 million Germans work in the agricultural sector. Increasing importance gets the trade and communication sector. For centuries the German map showed a patchwork of smaller and bigger independent kingdoms and principalities. The most important changes in the modern age resulted from the Napoleonic wars at the beginning of the 19th century, the Austro-Prussian War of 1866, the First and the Second World War. After the latter Germany was divided, and the country’s largest state Prussia, was dissolved. Most of the states as we know them today were established after 1945, but they have largely retained their ethnic traditions and characteristics and some of the old boundaries. Until Germany was reunited in 1990, the Federal Republic consisted of 11 states, which had been created in the former Western occupation zones and had adopted democratic constitutions between 1946 and 1957. In the Soviet-occupied zone, the later GDR five states were likewise formed but these were soon replaced by a centralized administration. After the first free elections in 1990 these five states were recreated with boundaries largely conforming to those prior to 1952. On 3 October 1990 the GDR acceded to the Federal Republic of Germany and Berlin became the capital of the unified Germany. The political and administrative principles in the Federal Republic of Germany are fixed in the constitution, the Basic Law since 1949. Germany is a republic and a democracy. The head of state is the Federal President, elected for a period of five years by the Federal Convention, which convenes only for this purpose. His tasks are mainly of a representational nature. The Bundestag is the parliament of the Federal Republic elected by the people every four years. The Federal Government consists of the Federal Chancellor, who chairs the Cabinet and is head of government. The Chancellor alone chooses the ministers and determines their number and their responsibilities. The Federal Republic consists of 16 states (Laender). These states are not like provinces but states endowed with their own powers. Each has a constitution, which must be consistent with the republican, democratic and social principles embodied in the Basic Law (Grundgesetz). Subject to these conditions they can shape their individual constitutions considering their specific regional requirements. The Bundesrat represents the 16 states and participates in the legislative process and administration of the Federation. The members of the Bundesrat are not elected by the people but of members of the state governments or their representatives. Depending on the size of their population the states have three to six votes, which may only be cast as a block. More than half of all laws require the formal approval of the Bundesrat, especially laws that concern vital interests of the states. In all other cases the Bundesrat only has a right to objection, which can be overruled by the Bundestag. The Basic Law constitutes the powers of the states and in which areas the states are allowed to make their own laws. Legislation and administration in the field of cadastral law is in the responsibility of the states. Security of land tenure in Germany has a tradition for some centuries. The methodology of land registration in former centuries had great variety because of the great number of independent states on the territory of the present Federal Republic of Germany. The basic laws have been quite different as well, because since the end of the 30 years war in 1648 states like Prussia or Saxony have been completely independent. At the beginning of the 19th century in some of the kingdoms cadastral systems have been established for taxation purposes. In some of the western provinces the establishment of cadastral systems for taxation purposes are based on the cadastres that were established by Napoleon in the occupied areas left of the river Rhine. Until 1876 the cadastre in Prussia was completed. Although the main purpose for the establishing of a cadastre was taxation of land, the idea of using maps and records for further purposes of governmental activities was implemented in the cadastral systems from the beginning. After the Deutsches Reich was founded in 1871, the need of standardisation of the private law was evident. Since January 1, 1900 the common private law exists for the entire country. In this context the land registration system for the whole country has been established. This land registration system (in German terms called „Grundbuch“) contents all rights of ownership and other rights and restrictions on land and buildings. With establishing this system, the importance of a reliable cadastral system grew very fast. The description of the land parcels (parcel identifier and cadastral maps) became the official and legal register of parcels as a part of the land register. Cadastre developed from a system for taxation of land to a register to guarantee the right of land tenure. After 1934 the results of the official soil assessment are recorded in the cadastre. This was the first step into the direction of a multi-purposed cadastre. Today, the cadastre fulfils all legal demands and requirements of administration and the private sector. It is a basic Land Information System (LIS) of great variety and flexibility in planning, environmental protection etc. Maps and cadastral records in most parts of Germany are stored in computer systems. Although cadastre in Germany is in the responsibility of the 16 states the computerised systems are unique with some small exceptions. These systems are the automated cadastral map (ALK) and the automated property register (ALB). During the last 15 years all staes introduced a new cadastral system which integrates the cadastral map and the automated property register within one data base. Even the land register is runing seperately by the administration for justice, a fully automated data transfer process ensure the consistency between the contents of cadastre and land register. The constitution of the Federal Republic of Germany assigns the responsibility for legislation concerning the land register to the Federal Republic whereas the states make the laws concerning the property cadastre. Interstate bodies (working group of state survey agencies) ensure uniformity of the property cadastre in all states. The land registration offices are part of the administration of justice in the 16 German states. The jurisdiction of the land registry officials, the form of establishing and maintaining the land register are manifested in the GBO and in additional orders of the federal minister of justice. The regulations of the organisation of the land registry are given by the states’ ministries of justice. the official for certifications of the land registration office. The administrator of justice is responsible for all external business of the land register. He is able to decide independent, his decisions are regulated and restricted only by law. The official for certifications has to register the contents of the administrator of justice in the register and countersign the records in the register. With respect to the federal constitution of Germany the responsibility for legislation in the field of cadastre is in the resposibility of the states. The states have passed various, basically uniform, laws in the field of surveying. The ministry responsible for surveying varies from state to state, normally it is placed in the ministry of the interior, but in some states as well in the ministry of finance, trade and commerce, or building and construction. lower surveying and cadastral agencies, their jurisdiction covers the territory of a shire or an unincorporated city. They are tasked to maintain and update the real property cadastre. The organisation of a cadastral agency varies when these offices have taken over more communal tasks like land valuation, planning etc. An organisational chart is enclosed. 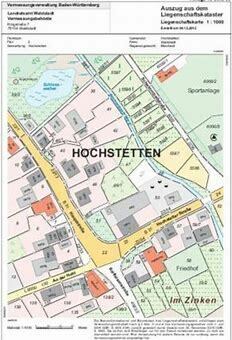 In all states except Bavaria licensed surveyors are mandated to do the cadastral surveys. Notaries are involved in the legal part of the business authenticating all kinds of contracts associated with buying and selling of land, mortgages etc. The "Deutscher Verein für Vermessungswesen" (DVW) -Gesellschaft für Geodäsie, Geoinformation und Landmanagement is the German Association of Surveyors and member of FIG. To promote the disciplines of geodesy, geoinformation and land management in science, research and practical experience. To contribute to the education, further training and professional development of its members, and in this context, to promote national and international co-operation. To co-operate with technical and scientific associations as well as with universities and other institutions. To contribute to legislative proceedings at federal level as far as the concerns of geodesy, geoinformation and land management are affected. To present the achievements and the importance of geodesy, geoinformation and land management to the public. Each state has its own licensing law for private licensed surveyors (except Bavaria, which does not have licenced survyors). The prerequisites for getting a license for one specific state is a university diploma for surveying and an education for becoming a civil servant with a final examination. At university level 9 universities offer education in geodesy, geoinformation, land management and surveying in a comprehensivel program. The average study duration is 5 years and about 260 graduates finish their studies annually. The university degree is Master of Science (MSc). At the BSc level 17 universities offer a 4 years program with approximately 580 graduates who finish their studies annually. At technician level Germany has a system of apprenticeship trainings. The apprentices are employees at surveying companies, licensed surveyors or the public sector. There they have a training on the job. In additional courses in schools they are provided with the theoretical knowledge for their job. This apprenticeship has a duration usually of 3 years and ends with an examination. The land register shows the legal status of all real property. In its documentation and publication role it works as the statutory basis for property conveyancing, in particular to ensure unequivocal status of ownership and other titles, as well as for mortgage loans. The cadastre in Germany is defined as the official register of all parcels and buildings in a state, in which all parcels are described with spatial and textual data. The real property cadastre is designed to show the de facto status of property. As far as legal property titles are concerned, the cadastre shows their scope and the part of the surface to which they extend. All relevant facts, such as designation, location, size and use, plus the boundaries as surveyed by authorised government agencies and licensed surveyors are described. The cadastre is the only register in which all parcels and buildings troughout a state are described. In addition, it contains further information, like the results of the official soil assessment. With some parts of its contents the cadastre enjoys the „public faith“ of the land register, like parcel-identifier in maps and records. This means that the state guaranties for the correctness of the land register and everyboby can rely on this. Cadastre became a fundamental element of all kinds of Geographical information systems and is part of SDI-projects on local, regional and national level. A lot of thematic applications are based on cadastral information which means that we speak nowadays about a multi-purpose cadastre whcih is acessable by modern state-of-the-art technolgy such as web services, XML files etc. In Germany there exists only one type of cadastre covering the complete territory with all kinds of landowners (private and state) and all kinds of land use (urban, rural, forests etc.). There are no issues with informal or illegal settlements. Until otherwise proven, the correctness of all titles recorded on the register is assumed. The land register enjoys the „public faith“, in other words, the details registered may be presumed correct by anyone acquiring a legal title with regard to property unless an appeal against the correctness is recorded or the person acquiring the title is aware of the entry being incorrect. Registrations therefore play an important legal role. They are in force until the evidence of the reverse. So do some contents of the cadastre, like the parcel-identifier in maps and records. The contents of the land register are based on private contracts certified by public notaries. It is not a deed system, but the contracts are stored in the files belonging to each record. Registrations are done only by application. So normally the land registry does not become active by itself. The cadastre in Germany is a parcel-based system, i.e. information is geographically referenced to unique, well-defined units of land. These units are defined by formal boundaries, marking the extent of land in the field. Each parcel is given a unique parcel-number. The cadastre, based on cadastral surveying, shows the division of the ground in form of parcels and contains information about the de facto status of property (location, size, use etc.). The land register contains the describing parts of the cadastre. Therefore only both systems in combination are able to give a complete overview about legal and de facto land tenure. Both registers must be constantly updated and kept in correspondence with each other. the privilege right to re-buy a property. the personal folio, in which all parcels of an owner are registered in one folio. The personal folio is the common form today. Generally, each parcel has to be registered in the land register, except parcels in state ownership, which are not part of a normal land market, e.g. streets. However, those parcels are registered in the cadastral system. Beside this official register there are files containing contracts and other documents related to the folio. As mentioned earlier the cadastre shows the de facto status of land properties in both spatial and textual records. The formerly parcel register in most parts of Germany has been operated in a digital system called Automated Property Register (ALB). The cadastral maps are digitised in the Automated Property Map (ALK). Both information systems, ALB and ALK define the basic Land Information System. After several years of implementation in 2015 a new cadastral system called ALKIS has replaced ALK and ALB in all 16 states in Germany. ALKIS stores all information in one object-oriented data base system. ALKIS is hamonized in all states, so that a nation-wide user can have access to the same structure of data across the whole nation. In all states the data are already available in digital form. additional details about the parcel, like parcel is part of a consolidation project, polluted soil, historical monuments, parcel is part of a nature reserve or a water reserve etc. topographical details like kerbs, cycle tracks, trees, embankments, walls etc. Since ALKIS is held in digital form, extracts can be put together individually following the requests of the user in analogue listings, plots or digital in well defined formats (e.g. XML, DXF, SHAPE). The new ALKIS concept follows consequentely the ISO and OGC standards with their topological features and other requirements in terms of data modeling and formally describing spatial data. The cadastral maps must be suitable as a basis for development plans and for the revision of the official map series. According to the legal tasks of the cadastral maps the contents are based on terrestrial surveys (boundaries, houses and buildings). Topographical details sometimes may be put into the maps by photogrammetry. In areas with a high accurate cadastre it is possible to create new legal boundaries from existing plans by calculating without surveying in the field. The components of the cadastral data bases for maps (ALK) and records (ALB) date back to the 70s and 80s of the last century. They were developed by the surveying and mapping authorities under the echnical environment and limited possibilities in that time. Links from ALK to the topographical information system ATKIS® have been very difficult because of different object catalogues. The developments did not follow national or international standards. With the introduction of ALKIS there was a semantic harmonization of the cadsatral and the topographical content. However, there are still some issues on where the topographical data should be collected. The 'Arbeitsgemeinschaft der Vermessungsverwaltungen der Länder der Bundesrepublik Deutschland' (AdV) (Working Committee of the Surveying Authorities of the States of the Federal Republic of Germany) decided to design a new and future oriented system ALKIS in combination with a re-design of the Official Topographic and Cartographic Information System ATKIS. enable the use of the entire geographical data of the surveying authorities for all users via a meta data system including quality information for all data and a standardised data interface for ALKIS and ATKIS. Of course links of the users’ specific data they already linked to ALK, ALB or ATKIS still have to be possible in the new systems without reasonable new investments on their side. They shall trust in the sustainability of their investment in data. Modelling of ALKIS and ATKIS are based on the ISO standard Unified Modelling Language (UML) and for the definition of the data interface Extensible Markup Language (XML). With the European directive INSPIRE all states are obliged to provide cadastral data in specific data formats and contents as well as several web services. With the emerging e-government projects, cadstral information will be published there as well. Hawerk, W., 2001. ALKIS ‑ Germany’s Way Into A Cadastre For The 21st Century, FIG Working Week 2001, TS 16.